The $22.95 Columbia River Gorge Priority Mail Express stamp issued Jan. 17 was the most expensive postage stamp issued in 2016, and the highest denomination postage stamp in U.S. history. Two factors were primarily responsible for a significant increase in the cost of collecting United States stamps in 2016, compared to the cost in 2015. The U.S. Postal Service issued more stamp sets consisting of multiple stamp designs in larger numbers, and this year it also issued high denomination stamps for Priority Mail Express and Priority Mail that were not offered during 2015. As a result, the cost to collect one each of all of the mint United States postage stamps and postal stationery items issued in 2016 climbed to $99.38, an increase of $44.35 over the 2015 total of $55.03. One important factor that concerns collectors is that many U.S. stamps cannot be purchased singly from post offices or from the USPS mail-order catalog, USA Philatelic, and to obtain a single stamp, a larger multiple has to be purchased. Collectors often must buy a full coil roll or a full double-sided pane of 20 to obtain a single stamp or small set, for example. To purchase stamps in the smallest format offered in 2016, collectors had to pay an estimated $468.80, compared to last year’s estimated total of $261.59. Online voting open for 2016 U.S. stamp popularity poll: In 2016, the United States Postal Service issued 154 varieties of stamps and postal stationery. Which stuck out most for you? The two tables presented below are organized into five categories identifying commemoratives, definitives (regular-issue stamps), special stamps (such as Christmas and other holiday stamps), high-denomination stamps (airmail, Priority Mail and Express Mail rate stamps, and dollar denominations), and envelopes and postal cards (postal stationery). The totals in these tables count individual stamps identified as major varieties by the Scott Specialized Catalogue of United States Stamps and Covers. The 26-year average cost for collecting one of each stamp and postal stationery item issued is $86.40. The two largest sets issued this year were the 20 different Pets definitive stamps issued Aug. 2 in a double-sided pane of 20 (Scott 5106-5125), and the 16 National Parks commemoratives issued in a pane of 16 (5080). In 2015, the two largest sets were the 10 A Charlie Brown Christmas special stamps in a double-sided pane of 20 (Scott 5021-5030) and the five Martin Ramirez commemoratives issued in a pane of 20 (4968-4972). To be clear, the lower 2015 cost to collect was the lowest total in a dozen years, and the 2016 cost is still less than the cost for stamps from each of the years from 2012 to 2014. This year collectors had to contend with three high denomination stamps ranging from the $1.20 Moon global forever stamp (Scott 5058) to the $22.95 Columbia River Gorge Priority Mail Express stamp (5041), with a $6.45 La Cueva del Indio Priority Mail stamp (5040) in the mix, and a $6.45 La Cueva del Indio stamped envelope (U693) tossed in for good measure. 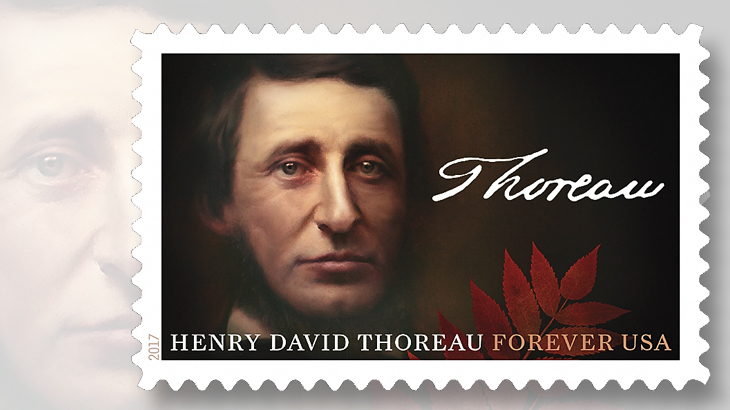 The $22.95 stamp is the most costly U.S. postage stamp in history. The total number of stamps issued in 2016 reached 139, topping both 2014 and 2015. That figure increases to 154 if you count in the 15 stamps that were sold in press sheets issued without die cuts. The 2015 total of 100 stamps and stationery items issued was the lowest since Linn’s began tracking these costs and totals in 1991. The previous low was 120 stamps in 2003, and the biggest number was 241 just three years later. Individual stamps from imperforate press sheets are not tallied in the tables on this page. If they were, the total 2016 cost to collect individual stamps would go up to $135.15. The forty additional U.S. stamps planned for 2017: These new subjects announced in November follow an earlier group of 38 stamps revealed in September. Press sheets without die cuts were only issued during the first six weeks of the year. The final press sheet issued without die cuts was the Year of the Monkey forever stamp on Feb. 5. 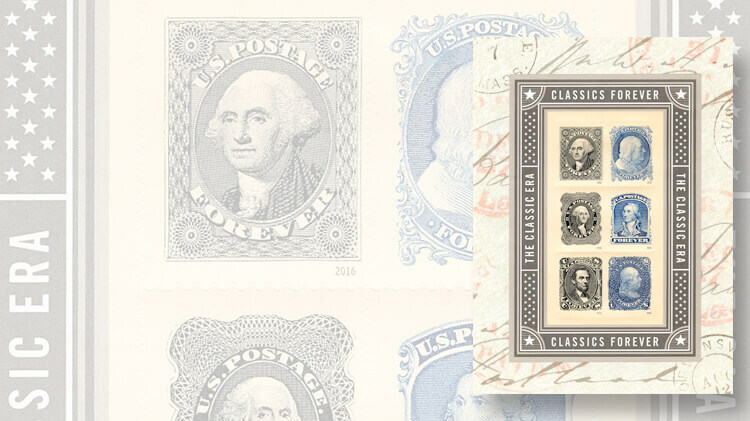 The change in USPS issuing policy came almost exactly one year after the Scott catalog editors announced they would begin assigning minor number listings to the imperforate varieties found in press sheets. The Postal Service discontinued the program without explanation, other than a statement that stamps and philatelic products were being re-evaluated. Press sheets with die cuts continue to be issued for all commemorative stamps and most definitives. A collector who bought every press sheet produced in 2016 at its designated retail price when issued spent $4,556.60 for 39 press sheets. That amount is actually a small drop from the 2015 total cost of $4,597.20. But in 2015, collectors were offered press sheets both with and without die cuts throughout the entire year. In that case, why are the two figures so close? This year, collectors were offered two press sheets at $688.50 each (for the $22.95 Columbia River Gorge issue), and two at $387 each (for the $6.45 La Cueva del Indio stamp). In 2015, there were no press sheets for high denomination stamps. The price of individual forever stamps and global forever stamps dropped by small amounts in April of this year. As a result, the Postal Service sold the forever stamp press sheet of the Botanical Art set of 10 stamps at $78.40 when it was issued Jan. 29, and at $75.20 less than three months later. All of the dollar values in this year’s totals reflect the cost of the stamp on the date it was issued. One interesting trend to observe is that the number of U.S. definitive stamps issued has surpassed the number of U.S. commemorative stamps issued for the second consecutive year. Since 1991, when these cost-to-collect figures were first tracked, the number of commemoratives has always been greater than the number of definitives, up until 2015. More stamps are now being issued in definitive formats, particularly as double-sided panes of 20, which the Postal Service refers to as booklets. It’s also worth noting that for the first time in 26 years, there were no postal cards and no letter-size stamped envelopes issued. The $6.45 La Cueva del Indio stamped envelope for Priority Mail was the only U.S. postal stationery item issued in 2016. Though it hasn’t released plans for any postal card issues, the Postal Service has already announced that a new Barn Swallow stamped envelope will be issued in 2017. How many Jack-o’-Lantern stamps were affected by die-cut shifts?